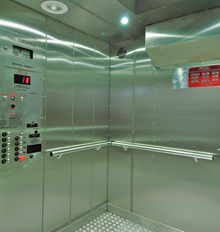 The PEGA passenger and material hoists are produced in wide range and varied as the customers demands. There is no matter what size, speed, capacity and colour. It is possible to enjoy ride with oversized comfortable hoist car. The extra large dimension of cage allow for transport of oversize construction material. The driving unit package for every single hoist and lift model is consulted, designed, put in operation and serviced by SEW Eurodrive, a traditional German driving units manufacturer. 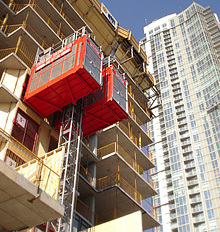 All hoists are programmable and can stop at landing with the highest accuracy. The PEGA hoists are equipped with plug and ride system which is the most efficientand fastest way to put the hoist in operation. The full collective control system expects you only to push the button either at the cage keypad panel or at the landing. 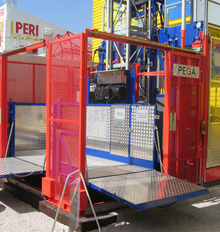 The unique PEGA-Fault identification system placed directly in the cage well visible for the hoist operator makes troubleshooting easy.